A vanishing edge creates a truly striking effect which is created by a lack of coping on part of the inground pool. Water spills over the pool’s far end into a hidden trough beneath, creating a foreground that blends seamlessly with the view in the background. If you are lucky enough to have a hillside or raised waterfront site, consider a vanishing edge pool as a breathtakingly beautiful feature. Salt Chlorination Systems are a popular and convenient way to maintain your inground pool. Salt water swimming pools are known for being low maintenance and will deliver a constant pure chlorine-based sanitation. Saltwater pools also have fewer chemicals, it’s softer on the skin and it won’t cause red eyes or green hair. Add colored lighting to your pool to change ordinary pool water into water that comes alive at night with fantastic colors. 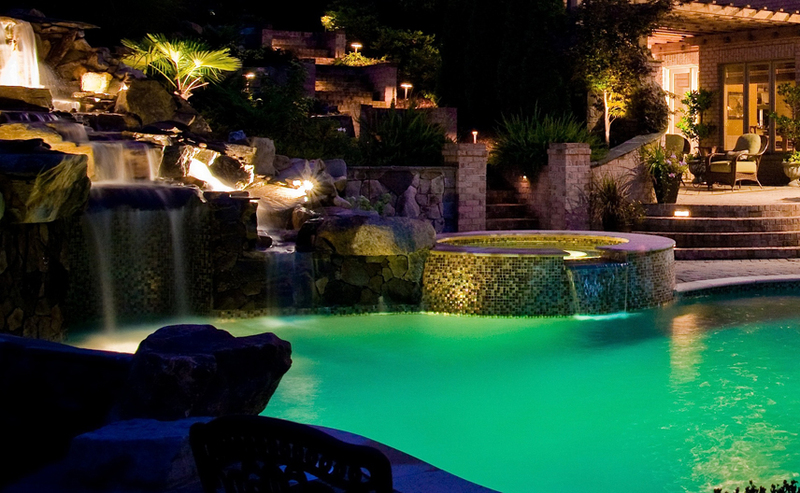 Lighting can transform your pool into a magical feeling environment that will have a lasting impression. Outdoor kitchens can be built right into the edge of the pool. Thirsty swimmers love swimming right up to the bar for refreshments or a meal without ever having to leave the water. A tanning ledge allows you to relax comfortably in your pool in only a few inches of water, allowing you to have lounge chairs with umbrellas or whatever you would like. A sheer descent waterfall creates a solid sheet of water pouring from the spillway. Combine this with a grotto and seating to experience the perfect escape from the stresses of daily life. Operating and maintaining your inground swimming pool has never been simpler with the recent ability to view and control your pool’s system from your phone or laptop. This automation allows you to program the pool’s circulation and cleaning cycles, lighting and heater. Our customers found that with Jandy Automation they can save up to 70% on their pools energy costs, and they love having super easy, automated push button control of every aspect of their swimming pool. Complete our quick & easy to request a quote. © 2018 Coogan's Design - Build All Rights Reserved.